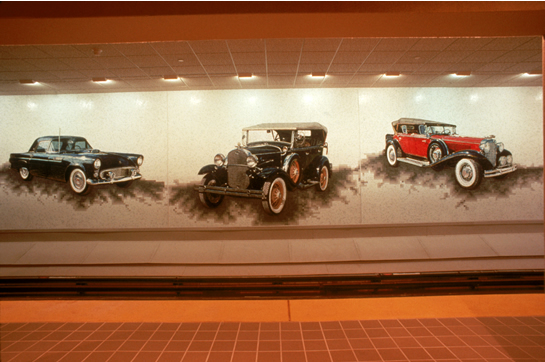 This spacious mural of seven vintage automobiles, executed in Venetian glass mosaic, is an engaging tribute to Detroit’s automobile industry. The two Chryslers, two Fords, two General Motors and a Cord were photographed for the mural from the Carrail collection of Richard Kughn. Funded By: The Chrysler Motor Fund, The Ford Motor Fund, The General Motors Foundation.